Want to lose your love handles? Have slimmer arms? Have leaner legs? For most, there are areas of our bodies that we wish we could tone and firm up. The mistake people often make is that they workout those specific areas thinking that will melt away the fat. 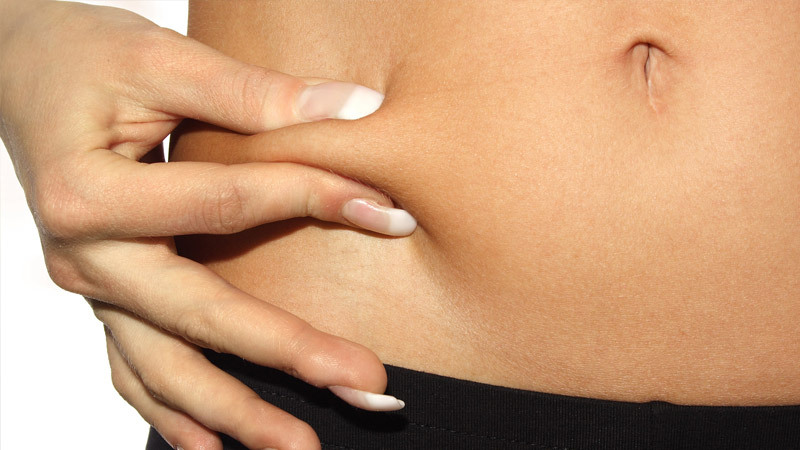 Unfortunately, it’s not possible to spot reduce or target the areas you want to lose in and make the fat magically disappear. Doing hundreds of sit-ups won’t give you a six pack, and doing isolated tricep (back of the arm) exercises won’t get rid of that arm flab. What does one do then to trim down those stubborn areas? Do you know what one of the best exercises you can do to slim down your whole body? Squats. Why? Squats work the largest muscles in the body (legs and glutes). The more muscle you work, the more calories you burn. Doing weighted squats will burn even more calories, because strength training creates an “after burn” – meaning your body will continue to burn calories after you stop exercising. If for example, you’re a woman wanting to lose upper arm flab. Doing isolated tricep exercises only work that specific muscle. You can’t dictate where your body is going to lose fat from. Doing squats would burn more calories and therefore help to burn more fat than just doing an isolated single muscle exercise. You can tone specific muscle areas by doing exercises that work that muscle, but you won’t be able to see any muscle tone until you lose the overlying body fat. I consider push-ups to be one of the best upper body exercises to help tone the arms. Not only do they work your chest, shoulder, and tricep muscles, but they are a great core exercise as well. Ideally, you want to have an exercise routine that involves working your entire body. The more muscles you work, the more calories you’ll burn. AND, the more muscle you have, the more calories you’ll burn. Strength training is ideal, for it builds muscle, and it’s the muscle that burns calories (and therefore fat). For each pound of muscle you gain, you can burn an extra 50 calories a day, even at rest. Of course there’s more to it than just strength training. Cardiovascular exercise and a balanced nutrition plan are just as equally important. The key is to incorporate all three. Short on time? Strength training can be done circuit style, and then you get the strength training aspect and cardiovascular component as well. Don’t undo all the hard work with a poor diet. What you eat determines if your body is going to store or burn fat. You want to burn fat when you exercise, not what you just ate or last night’s pizza. Eat a low fat, low sugar diet with adequate amounts of lean protein. Cut back on calories, strength train, and get that heart pumping. Nutrition, exercise and cardiovascular exercise – the magic is on the combination of these three crucial components to fat loss. There’s no magic pill or exercise to spot reduce, but with this powerful combination, you’ll lose more body fat, and in turn you’ll lose from the areas you desire.